Yesterday saw the start of a new developer group, this time not based in London but on the south coast in Bournemouth. Scott Lovegrove of Ferret Labs and Dan Thomas of Moov2 conceived the meet up. The core idea in creating the group is simple, to bring developers interested in both Windows Phone and Windows development together. With the looming releases of both Windows Phone 8 and Windows 8 now seemed like the time. We signed up to attend the event and were invited to present a short talk. With everything from games development to a platform overview of Windows Phone 8 from a Microsoft evangelist, it proved a very worthwhile trip. The event was generously hosted by local digital agency redweb. As well as the excellent space, they were able to provide a great meeting room and a fridge stocked with refreshments for the ever-thirsty developers. We arrived after a very early start to make it for 10am to find that the place was already buzzing with devs. We took our places and the talks began, first it started off with a show and tell section. Ross Gouldthorpe - Atoms Demo - An Amiga game reimagined! First up was Ross Gouldthorpe from gouldfishgames he presented a look at his Amiga inspired game Atoms. The game created in XNA, looks great, very smooth and sporting some compelling animations and graphics. The game is currently undergoing certification but we got a chance to catch up with Ross, we will post the video up a little later. We then got a look at Scott Lovegroves newest app, a Twitpic browser that he's currently working on, FerretPic , an app designed to fill a gap for browsing twitpic photos with some nice additional tweaks and facilities. Dan Thomas then presented using his own app Code Breaker, sharing his experiences developing his first app for Windows Phone. These events provide a great environment in which to gain real insight into what it is like developing for the platform. Dan gave some good tips on the importance of measurement when having an app in the marketplace, showing how he is able to track numbers effectively, find out levels people are reaching in his game and other insightful statistics. You can try his app here. David Hamilton, creator of the social music app, Pepper was there also. David had some great tips for developers interested in taking their business further, with advice on joining the BizSpark program along with his recommendation to get out there and network (something David is good at, we can report). Interestingly he was asked about the choice to go with Windows Phone as their launch platform. Whilst one of the main reasons cited was it being a relatively familiar environment in which to program, another surprising one was that Windows Phone is still in growth phase with plenty of opportunity. As Windows Phone does not have the marketplace saturation as iOS he believes that, in itself, offers the chance to make an app, build on it and have it make its mark rather than join an already crowded environment where it is next to impossible to get visibility. Good stuff indeed. As Pepper is heavily involved with the music industry, he has found that due to iOS and Android apps mostly having the same look and feel, Windows Phone is received by many people in the music industry as something altogether more fresh looking. Pepper is about to go fully cross platform. David thinks the success of Pepper has been enabled by the application first being able to distinguish itself on Windows Phone first. 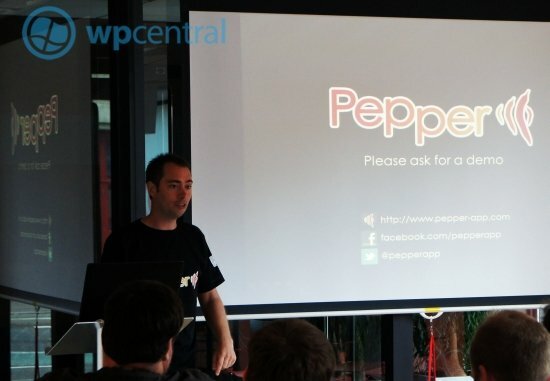 People have come to Pepper asking for iOS and Android versions after seeing and hearing about Pepper on Windows Phone. How often does that happen? wpcentral - Rich and Myself - talking, not typing..
After a short break, it was straight back into it with Scott Lovegrove. We were given an excellent talk about the advantages of using SketchFlow for prototyping apps with the aid of some demos. SketchFlow is part of Expression blend and helps turn ideas from concepts to a finished project. 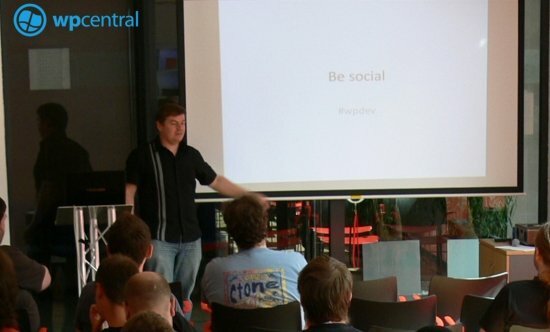 We were asked to do a talk about wpcentral. Richard Edmonds and I prepared a small introduction to what wpcentral does. Essentially, we wanted to do an overview of who we are, what we cover and why we attend these developer events. The message is simple, we attend to show our support for the community. We make ourselves visible to developers to engage with us about what they are working on, and where possible offer any advice where we can. I certainly hope our enthusiasm for the platform was evident from our talk as we are unaccustomed to public speaking we were both a little nervous, so thank you to the attendees for not going too hard on us. 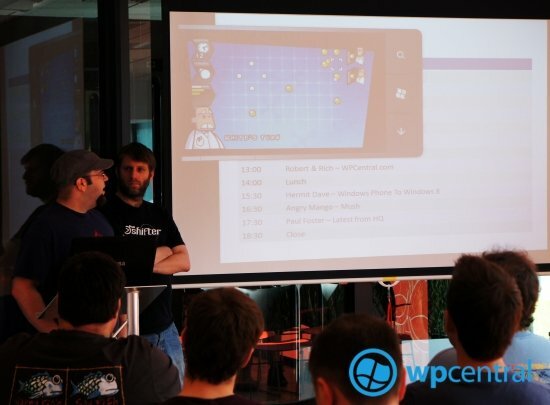 After our presentation, Hermit Dave was up to talking about cross platform development between Windows Phone and Windows 8. Many good examples of what is possible and how best to achieve it. As with any Windows 8 sessions, there remain some gaps but coming to events such as this provide excellent insight into how people are getting on. We have a separate article to cover the next session. Angry Mango was here to tell their story of the trials and tribulations of getting Mush from prototype to Xbox Live certified. We really enjoyed their talk, Rich will be writing up a full overview in a separate post so please look out for it and the video interview too. To finish up the day, we were given a complete overview of what to expect from Windows Phone 8 from Paul Foster. Paul is an evangelist for Microsoft, so he was keen to stress the potential coming opportunities with Windows Phone 8. As well as the talk, Paul also gave a very patient explanation of what exactly Metro was to a gentleman that had perhaps become a little strange after having too many complimentary beverages. Paul did a great job of outlining the new features and explain as far as he could explain what was coming, unfortunately for us, he had nothing new to share beyond what had already been announced (we did ask - NDA). As there were a good number of people there that currently aren’t developing for Windows Phone this talk likely painted a good picture of what they could expect down the line from Microsoft, many of whom likely don’t follow Windows Phone to the same extent as some of us. As this was the first event in Bournemouth, we were glad that it attracted a large crowd. The spread of those people in attendance was also interesting. 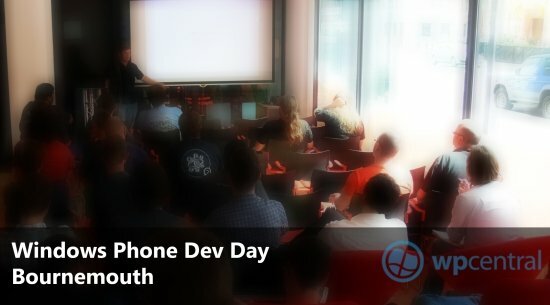 Many of those that came along were iOS or Android developers, whilst most had seen a Windows Phone, a fair number didn’t currently own one. Let’s hope after Saturday they have reconsidered that. Thanks to Scott and Dan for putting the time in to put on such a great event. We urge any developers living on the South Coast of the UK to get in touch and attend the next one.